Dodge City had no problem with Wichita Southeast in Week 2 registering a 50-8 win. Dawson Williams led the Red Demons with five touchdowns and 175 of the 346 team rushing yards. The Dodge City defense allowed just 107 yards of total offense. The game was suspended on Thursday night and continued in Dodge City on Friday. Olathe East earned its first win of the season with a 20-14-overtime victory over Olathe Northwest. Junior running back Will Scofield scored two touchdowns for the Hawks in the win. Jack Mason scored the other touchdown for Olathe East. Olathe North came away with a 21-20 win over rival Olathe South. Despite only rushing for 29 yards on 18 carries, sophomore running back Mason Myers found pay dirt three different times. Senior back Jonya Boyd led the Ealges in rushing with 125 yards while classmate Deion Poindexter added 97 yards on the ground. Despite the game being called with 6:41 to play in the fourth quarter, Manhattan remained undefeated in the young season with a 28-6 win over Washburn Rural. The Indians’ Iverson Robb found the end zone three times on way to a game high 135 rushing yards. 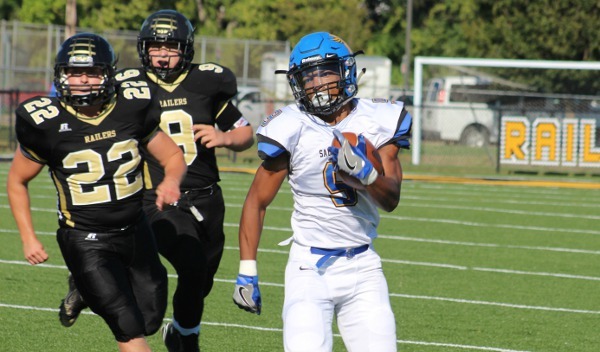 It took a couple of days, but the Hutchinson Salthawks finished off the Newton Railers 46-21. Friday night’s severe weather caused the game to be postponed until Sunday afternoon. Hutchinson racked up 448 yards rushing in the game including 191 yards and a touchdown by Tracy Harris. Brody Smith also topped the 100-yard mark with 134 yards on the ground. Smith also returned a kickoff 72-yards for a score. Kade Remsberg led Newton with 202 rushing yards and two scores on 15 carries. Pittsburg scored early and often in a route of Chanute, 44-0. The Purple Dragons scored on six of its first seven possessions highlighted by a 50-yard touchdown pass from Ty Roark to Elijah Harris. Noah Vaughn scored two touchdowns in the win for the Purple Dragons. Maize improved to 2-0 on the season by outscoring Goddard-Eisenhower 45-35. The Eagles rode on the back of Daylyn Johnson, who rushed for 257 yards and six touchdowns in the win. St. James Academy grinded out a 12-7 victory over Blue Valley Southwest. The Thunder lone touchdown came on a 21-yard pass from Sammy Wheeler to Travis Pickert. Nick Ingolia made two field goals to account for the other six points. Only half of the game was played but Topeka Seaman gets credit for the win after leading 23-0 at the half over Topeka Highland Park. Mike Latendresse scored twice and Kevin Moranz found the end zone as well for the Vikings three touchdowns. Atchison rolled to a 51-8 win over KC Sumner Academy. Senior running back Sylon LeBlue rushed for a team high 129 yards and three touchdowns in the Redmen win. Fellow classmate Adam Smith threw for a touchdown and ran for another for Atchison. Augusta overcame an early miscue and turned a 7-0 deficit into a 20-13 win over Clearwater on Saturday afternoon. Luke Dockers rushed for 188 yards on 25 carries and scored all three touchdowns for the Orioles. Basehor-Linwood cruised to a 51-12 win over Spring Hill to improve to 2-0 on the season. The Bobcats scored two defensive touchdowns in the win after Jackson Sherley took an interception 96 yards the other way for the first defensive score followed by TJ Williams’ 75 yard interception return for a touchdown. Independence used two big scoring plays to beat Fort Scott 14-11 on Friday night. The Bulldogs scored on a Josh Pralle’s first run of the night of 56 yards. Will Schabel scored in the third quarter from 36-yards out that proved to be the difference in the game. Pratt used a big first half to cruise to a 49-13 win over Haven. The Greenbacks scored 42 points in the first half and were led by senior Hunter Kaufman who rushed for 110 yards and three touchdowns including a 65 yard rushing touchdown. Columbus stomped Southeast-Cherokee 53-7 to improve 2-0 on the season. The Titans scored three times on the ground with Shawn Robinson, Tommy Shallenberger, and Keenan Stanley each earning trips to pay dirt. Quarterback Ridge Smith passed for two touchdowns on just three attempts in the win. Girard used a huge first half to blow past Riverton 42-6 to earn its first win of the season. The Trojans scored on all five first half possessions and were led by quarterback Eric Wilson who rushed for four touchdowns and threw for another. Isaiah Fisher found the end zone twice in the Trojan win. Smoky Valley delivered a 19-12 home victory versus Larned before three rushing touchdowns by Kyle Anderson. The game was delayed 30 minutes by lightning. Larned had 11 penalties for 83 yards. Anderson rushed 22 times for 144 yards. Smoky Valley finished with 40 carries for 201 yards. Maur Hill-Mount Academy moved to 1-1 with a 31-13 victory over McLouth. Maur Hill went up 31-0 with freshman Jack Caudle at quarterback. He completed 10 of 12 passing for 196 yards and two scores, plus a rushing TD. After three touchdowns, Arthur Rocha tacked on a 31-yard field goal for a 24-0 lead at halftime. Garden Plain’s Nate Pauly led the Owls to a 33-14 victory versus Wichita Trinity Academy. The game started Friday at Eisenhower and then ended Saturday at Trinity. Pauly opened the second half with a 92-yard kickoff return for a 27-6 lead. He also threw a 52-yard pass and rushed in from five and nine yards out. He rushed 14 times for 78 yards and completed 6 of 7 passes for 124 yards. GP (2-0) opened the season with a quality 33-27 victory versus Hesston. Conway Springs earned a 26-6 victory versus Wichita Independent. The game turned on a blocked punt returned for a touchdown in the third quarter. Colton Terhune tallied 107 rushing yards, while Riley Akiu finished with 101 yards and two scores. Halstead held off Hesston, 26-24. Tony Morris rushed for a 75-yard touchdown with 5 minutes, 19 seconds to play and finished with 162 yards. Layke Heimerman tallied 91 yards on the ground. Hesston quarterback Zach Esau passed for 180 yards. In Halstead's 36-6 victory versus Smoky Valley in Week 1, Morris returned the season-opening kickoff 90 yards for a score. Sacred Heart rolled over Russell, 41-0, in a home victory Friday. The Knights (2-0) limited Russell to 103 yards in total offense. Jacob Faerber finished with 17 carries for 117 yards and a pair of scores, while Abel Alvarez had 14 carries for 84 yards and a touchdown. Faerber also caught a 24-yard TD pass. Connor Wetter had a 16-yard interception return for a score. David Anderson and Caleb Jordan both played under center for Sacred Heart. Olpe defeated Caney Valley, 14-7, in a rain-shortened game. The game started 45 minutes late and then the teams played the first half before the contest was eventually called. Justin Dieker, playing in place of injured tailback Dylan Redeker, rushed for the eventual game-winning 60-yard touchdown run and had nearly 100 yards of offense. Damon Schmidt picked off three passes, including a key interception as Caney had 1st-and-goal from the Olpe 7-yard line. Elkhart (2-0) has permitted just 12 points in two weeks with a 23-0 win versus Southwestern Heights. The Mustangs ran 23 more plays but had four turnovers in the loss. Elkhart scored eight points in the first quarter, seven in the second and eight in the fourth. Senior Shon Villa finished with 19 carries for 128 yards and a touchdown, while senior Tyler Sklenar completed 7 of 13 passes for 100 yards with a score. Villa led Elkhart with 11 tackles, while junior Damyan Don Juan collected two sacks and caused a fumble. St. Mary’s Colgan picked up the 600th victory in school history with a 34-24 win over Baxter Springs. The Panthers trailed 18-13, at halftime but rallied to take a 34-18 lead. A key 3rd-and-27 touchdown in the third quarter turned the game for the Panthers (1-1). Billy Dickey found Josh Hayes on the 41-yard touchdown throw with 7 minutes, 32 seconds remaining in the third giving Colgan a 21-18 lead. Dickey completed 7 of 10 passes for 130 yards, rushed for 35 yards and tallied three total scores (two rush, one pass). Colgan travels to rival Frontenac this week. Victoria (1-1) picked up its first win of the season with a 50-20 victory against Macksville. Knights quarterback Collin Kisner carried 16 times for 139 yards and scored three rushing TDs. Kisner threw a touchdown to Cooper Pfanenstiel on his lone completion. Bryant Karlin rushed 12 times for 90 yards and a TD. Tyler Knoles returned a kickoff 75 yards. Victoria has two kick return touchdowns in two weeks. Hill City won, 26-0, at Stockton. Gabe Hamel rushed for 189 yards and three scores. Domineck Journigan collected seven carries for 87 yards and a TD. Hill City (1-1) travels to St. Francis, 2-0 and ranked No. 1 in Eight-Man, Division I, this week. The Ringnecks opened with a loss versus Spearville, ranked second in Eight-Man, Division I.
WaKeeney-Trego (2-0) moved to 8-3 in its last 11 contests with a 24-20 road victory versus South Gray. Keagan Shubert passed for 33 yards and a score, while Hunter Price and Hunter Folsom combined for 124 yards. WaKeeney gets Quinter, on a 14-game losing streak, and has a chance for its first 3-0 start since moving to the eight-man ranks. Logan-Palco defeated rival Northern Valley, 66-28, with another big game from David Thompson. He rushed 22 times for 193 yards and four scores. Caden Kinderknecht passed for 115 yards and rushed for 188 yards or Northern Valley. He passed for and rushed two yards apiece. Central Plains (2-0) rolled over Ness City, 54-8, as Devin Ryan threw three touchdown passes. Alex Barton caught 19- and 35-yard scoring throws, while Anthony Oberle had a 14-yard scoring catch. Bryce Miller and Dalton Beck tallied two scoring runs in a game called in the third quarter. The Oilers travel to Otis-Bison (2-0) in a key game Friday. Gerald Morehead had a standout performance in South Central’s 38-8 home win versus Minneola. The T-Wolves’ veteran senior quarterback passed for 55 yards and a score, and rushed 25 times for 161 yards and three TDs. He also had eight tackles with a pair of TFLs and recovered a fumble. South Central is 2-0 following a season-opening 34-8 win versus Ashland. Wilson (1-1) held off Chase, 30-26, in a Northern Plains League contest. Chase had won 18 straight regular season games the last two seasons before starting 0-2 after a season-opening 56-32 loss to Beloit St. John’s-Tipton. Wilson had been 1-7 in its last eight contests versus the Kats, including a pair of 56-6 losses the last two seasons. Sharon Springs-Wallace County lost for the second straight time in the regular season, 26-20, against Atwood-Rawlins County. The Wildcats fell, 22-20, at St. Francis in the season opener. Before 2016, Wallace County hadn’t lost in the regular season since Week 4 of 2011. Standout Grady Hammer didn’t play Friday. Coach Jeff Hennick confirmed Sunday night that Hammer broke his hand the third play of the St. Francis game and will have surgery Monday. Rawlins County (2-0) led 26-8 at one point in the game. Hammer is expected to miss a couple of weeks and then likely play with a cast. Senior Levi Johnson stepped in at quarterback and completed 8 of 13 passes for 59 yards with two scores and a pair of interceptions. He also rushed 12 times for 55 yards. Caldwell won at Argonia-Attica, 90-48, in a wild game that was moved from Friday to Saturday because of the rain. Caldwell led 22-0 after the first quarter and then had 24-14 and 22-12 edges in the next two quarters. The final quarter was tied at 22. Caldwell ended the Titans’ 21-game regular season winning streak that dated back to a 66-56 loss at South Barber in Week 7 of the 2013 season. Colten Ward rushed 24 times for 324 yards with six rushing touchdowns. He also completed six of seven passes for 128 yards and three touchdowns. Dilyn Volavka finished with six catches for 128 yards and three scores, while Dakota Volavka finished with 17 carries for 105 yards and a pair of scores. Corbin Rice also scored on an interception return. Caldwell (2-0) scored on all six second half possessions. A&A ran 67 plays for 392 yards. Titan senior Seth Hemberger led the Titans with 18 tackles. Caldwell had lost 42-14 to A&A in 2013, 60-38 in 2014, and 59-0 last season. The Axtell Eagles picked up their first win 54-26 at Valley Falls. Burke Deters had an exceptional night on special teams, returning four kick offs for a total of 190 return yards including two touchdowns. Axtell’s schedule also includes a game at Southern Cloud on Monday, September 12th. The Manhattan-Flint Hills Christian Eagles topped St. John’s Military 56-6 in KCAA action. Manhattan was led by senior quarterback Derek Bowman who rushed 11 times for 203 yards and five touchdowns. Bowman also passed for 54 yards and a pair of touchdowns to Dylan Peters. The Manhattan Eagles return to action this week at Veritas Christian. Cheylin scored in each quarter to outlast Wheatland-Grinnell 34-26. Junior Manuel Castillo led the Cougars with 183 rushing yards and two touchdowns on 27 carries. Castillo also caught a 15-yard touchdown pass from Carter Porubsky. Porubsky added 60 yards on the ground and a touchdown for Cheylin. Jorge Esparza rushed for 116 yards and two touchdowns to lead the Thunderhawks. Golden Plains improved to 2-0 on the season with a 51-29 win over Pawnee Heights. The Bulldogs were led by sophomore A.J. Camacho’s 218 rushing yards and a touchdown on 21 carries. Camacho also passed for 104 yards and four touchdowns, and caught a touchdown pass. Dawson Spresser added 108 yards passing for Golden Plains, while Jesus Aragon also threw a pair of touchdown passes.